The Ecumenical Advocacy Alliance is a Swiss based international network of churches and church-related organisations. They approached Designworks to create a unique Annual Report. 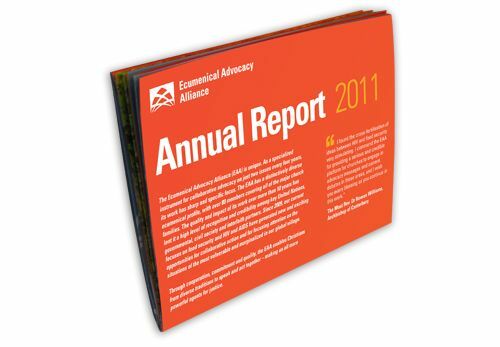 The client wanted to get full use of the annual report by combining the design of the report with an A1 sized poster. One side of the A1 sheet featured a photo, taken by professional photographer Paul Jeffrey, and text from “Franciscan Benediction”. The flip side contained the information for the annual report. The sheet folded down to a neat A5 document to be distributed worldwide.